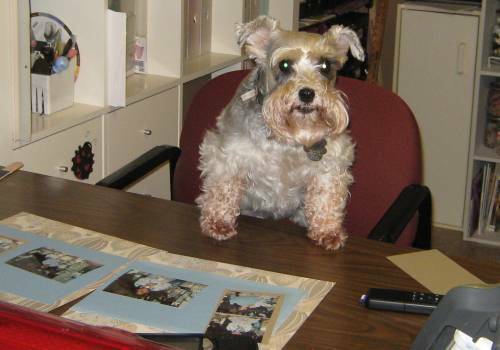 I am really a bit ashamed to say it had been over a year that I had done anything to my paper organization but it is true *okie hears a few gasps, looks out everyone with a bit of a perturbed look on her face* OH PUULLLEEZZZZ!! I'm so sure all y'all keep yours organized and update on a daily basis! Anyway, I had cardstock here and there and packages of colors with scrapbook paper and my Graphic45 hadn't been updated in awhile either so it was quite a task I had before me but since it was too hot to do much of anything I thought I could use the time to get 'er done! I took this picture after I had already started doing a little. I got the blue plastic bins at Goodwill and I have no idea what they were suppose to be but I know they were used to stand vertical but horizontally they work great for holding my cardstock. 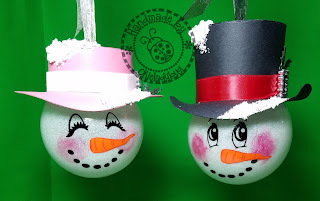 They are really heavy duty so I don't worry about them tearing up and since they are solid they can't fall apart. I have a hard time trying to figure out colors and I thought the greens were bad but I quickly decided that I think blues are the hardest color to organize because there are just so many dang shades of blue and how I ended up with so many shades I have nodea and to be honest I still don't have the right shades of blue! I have tons of teal blues and I do remember how I ended up with all those. 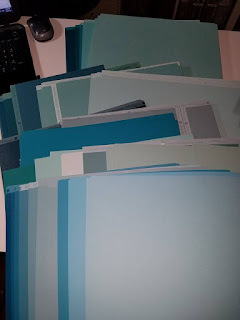 A few years back Consumer Crafts had an awesome sale on the Coredinations, such a good sale I got multiple packs of whatever I could and it seems that the teal is what I use least because it is what I have the most of left now. At this point I was begging people on Facebook to come and organize my blue cardstock for me. Not one person ever showed up to do the task *okie thinks she has a lot of slacker friends*. After much persistence, many paper cuts and feeling like I was going blind I got it all done! 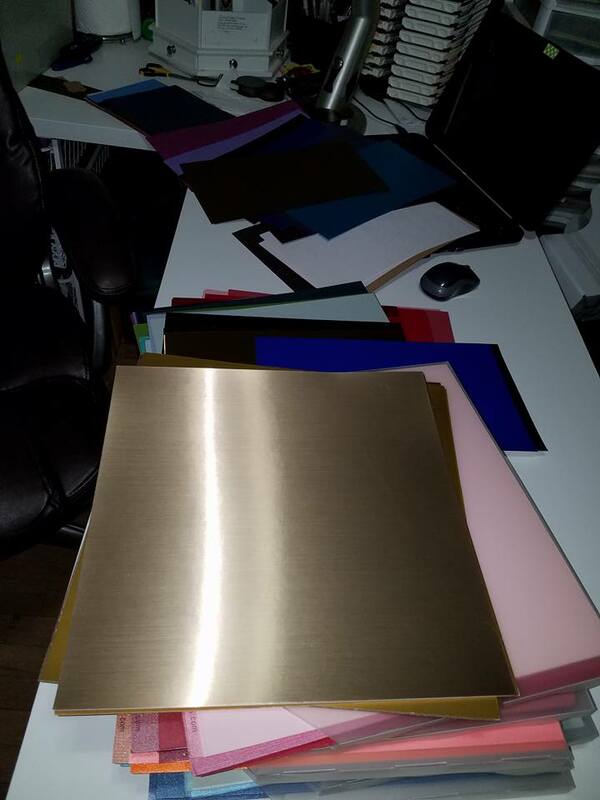 Next up was getting my, for lack of a better word "glitzy" cardstock in order. 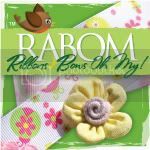 If I thought my regular cardstock was scatter then my glitzy was like hunting for Easter eggs! I kept finding it in all different places and when I did find it somewhere that might be odd I would remember why I had it with certain paper but decided it needed to be all together. I had Bazzill bling, Coredinations gems, metallic, opalescent, brushed metal and mica to get in order. I did mix all those different ones together and put them with their color hoping it will be easier for me to find when I am wanting something glitzy. 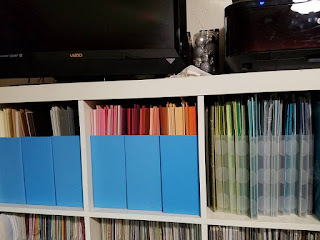 Since moving my regular cardstock to the blue containers I had a lot of the Cropper Hopper holders free and it worked out great for getting a lot of my other papers organized and labeled. I have one of those Brother P-Touch label makers and I absolutely love it! I didn't label my scraps, but that is what is to the left of the glitzy cardstock. 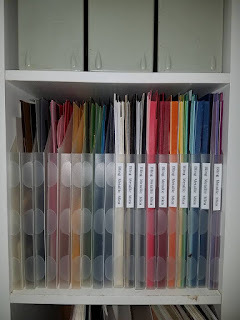 At the time I took the picture I hadn't gotten to my specialty cardstock but it is now organized and on the shelf right below this one. Specialty includes, faux textures, foam, vellum, vinyl (thin for paper not my regular vinyl) washi sheets printables and also I was able to fit my birthday and kitchen category papers on the shelf as well. 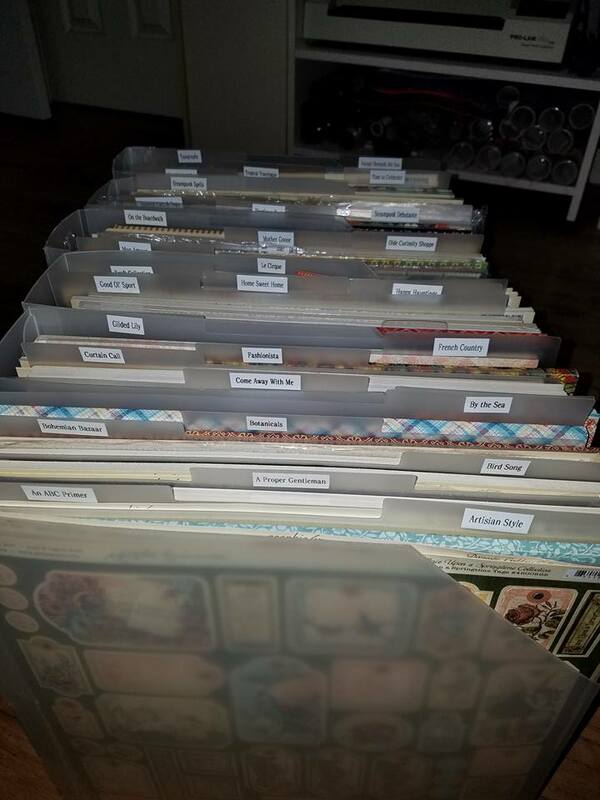 I got my scrapbook paper reorganized and the companies separated again, such as K&Co, MME, Stampin Up, DCWV, Basic Grey and Graphic45. 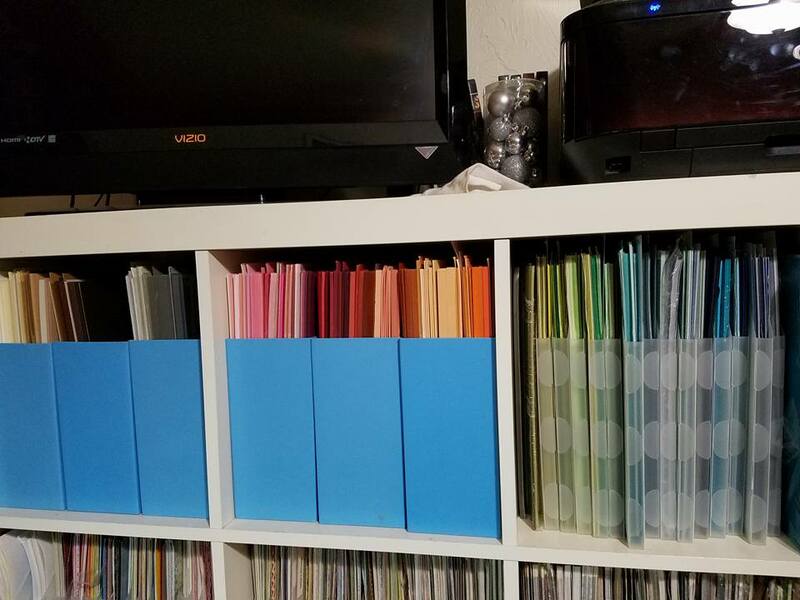 This is a picture of my Graphic45 papers, sans any Christmas collections *okie thinks it is obvious those would go in the Christmas section*. I even finally updated my inventory of my Graphic45 so hopefully I wont make the mistake of buying duplicate packs, which I did do one time in the past. 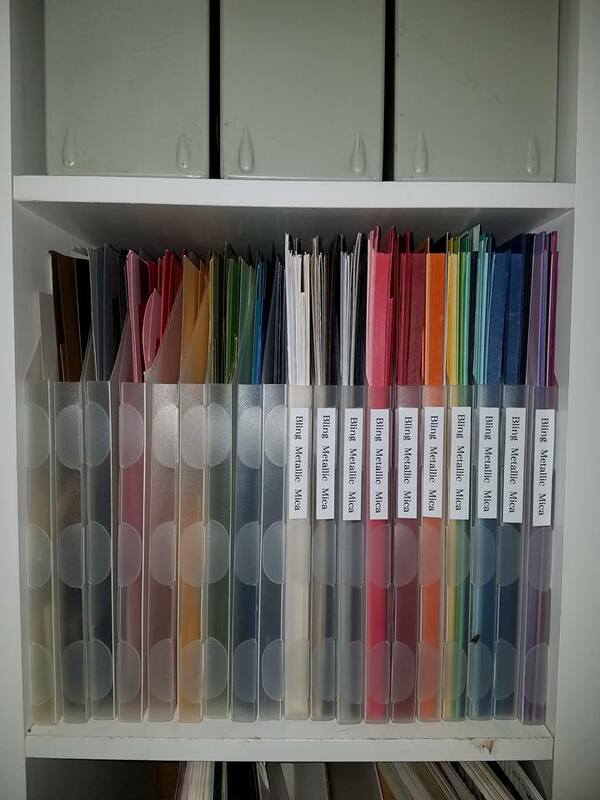 My inventory is done in Excel, just like my stamps, punches, embossing folders, etc, so it makes it easy to go in and add and keep things in alphabetically order. 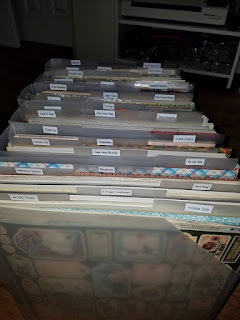 My poor scraproom looked like a paper flea market for about a week while I was getting this all done but I am glad I did get it done and it looks so much neater now and it will be easy to find what I m looking for when I want to do a project. Which was not long after I got it all organized! I was sent the Close To My Heart Flower Market cartridge to review and tomorrow I am going to show you a project that I did with that cartridge. Would someone get the lady in the back who fainted some water? I guess it was bit of a shock to her that I used a Cricut cartridge. Is she okay? *okie sees someone nod their head yes* Alrighty then, y'all be sure to come back tomorrow and check out the project! I do this paper organizing about once a year too. This year my sister was visiting from FL for a week so I had to clean up the spare room which is also my scrapping room. What a chore!! Took me a week, but it got done in time and now I can't find anything! LOL! Your paper looks outstanding! First off, I'm envious of the amount of paper/colors/variety you have. Second, your organization is impeccable. You need to be one of those people who goes to other people's homes and organizes all of their things. You really have a knack for it! I get irritated with myself when I let my organization lapse. One thing about always organizing is that it helps me remember what all I have. I have no idea who makes them or what they are originally for, I found them at Goodwill.